This stunning beauty on Horseshoe Lake has 100 ft of perfectly level sand beach, large landscaped lot, gardens, shuffleboard court, lakeside paver fire ring, extra detached 2 car garage for storage, and blacktopped drive. 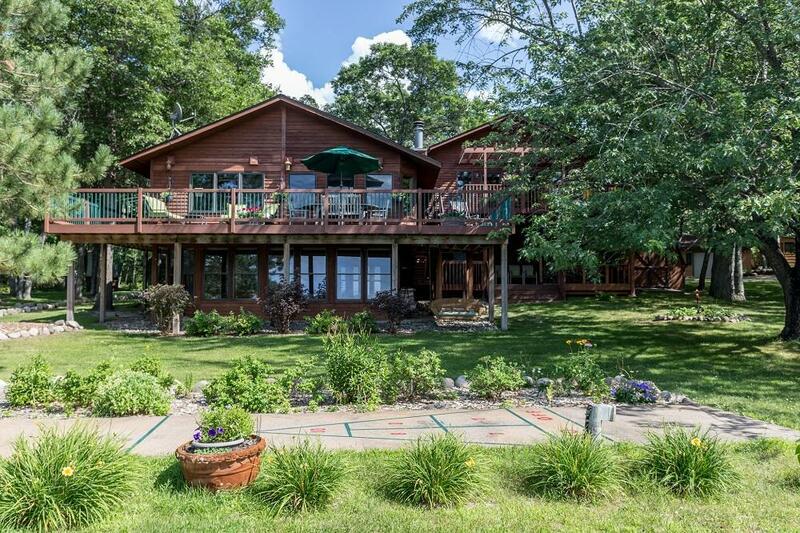 Home features: 5 bedrooms, 4 baths, great room with stone fireplace, main floor master suite with private deck and hot tub, gourmet kitchen, lakeside dining area, relaxing lakeside sunroom. The separate loft guest area provides a full bath, 2 bedrooms, family room, fireplace and lakeside deck. Lower level includes a family room with wood burning fireplace, 2 bedrooms, full bath, second kitchen/dining area and a 3 season porch. Large wrap-around decking is maintenance free. 2 Car attached garage is insulated and heated. Plenty of space to entertain your family and friends at the lake. Horseshoe is a premier lake in the Brainerd Lakes Area known for its sandy beaches, clean water, recreation, fishing and a convenient location for restaurants, golfing and shopping.